Grantland did a piece on John Wall showcasing the young star's tendency of settling for jumpers instead of attacking the rim. The article by Sebastian Pruiti includes several youtube clips of John Wall's bad habits and I agree with some of his analysis as he gets us excited about the maturation of JW to a superstar. John Wall is a scorer that can't hit a jump shot. His shot is just not that great at this point in his career. 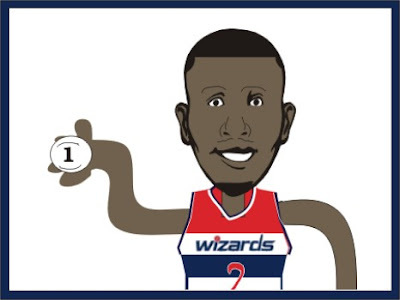 However, as the article shows, what adds on to that deficiency is the kinds of shots J-Wall is taking. As Pruiti says, Wall needs to attack attack attack. If he attacks instead of settling it will end up opening him up to getting more fluent shots. The defense is going to give him the jump shot all day long until he improves, so he is going to find ways to attack against a sagging defense. Luckily, Wall is only entering his second year, so he has plenty of time to get in the gym and work on the jumper. His 40% shooting percentage was pretty bad last year, and I think if he can get that up to 45%-50% he should do very well. Once he starts sinking the shots he missed in his rookie year, the defense will have to come out on him, and then we will see the superstar emerge. His other flaw, which isn't great for a PG, was his almost 4 turnovers per game. If he can get it down to 2 for the next few seasons while he develops into a scorer, that would be great. That kind of 3-4 turnover per game sloppy play is more acceptable when you are a superstar scorer like Allen Iverson or Dwayne Wade, but as a PG you have to score 25-30 per game to get away with those extra turnovers. Wall isn't there yet.